Rob writes: On Wednesday, John Schaust, Chandler Roberts, and I headed down to Goose Pond FWA for a Christmas Bird Count. We met up with the rest of our team at the McDonald's in Linton at 6:45 am and were headed to our unit by 7:15. On our way in, we had 3 Short-eared Owls fly right over the road in front of our car. Once in our unit, we split up to cover more ground 2 of us took the higher ground on the levee and 2 others stayed down in the grasses. It didn't take long before the two down in the grasses were on to something! They called us over and the first bird I got my binoculars on was a Nelson's Sparrow! I was unaware at the time but have since found out that it was the first Nelson's Sparrow ever seen in Indiana during the month of December. 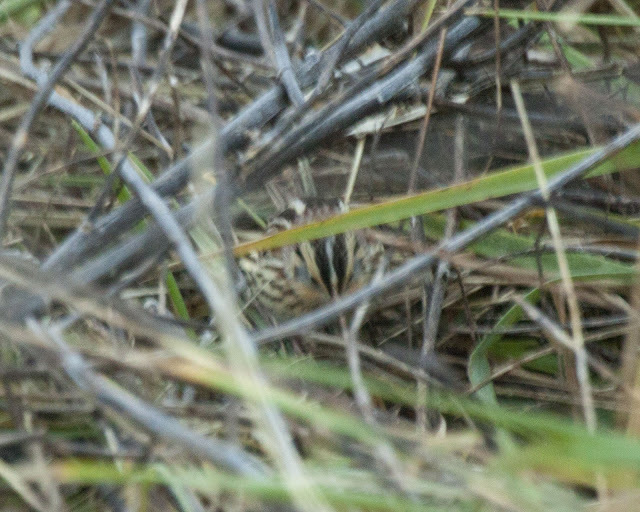 Along with the Nelson's were at least 2 LeConte's Sparrows. We covered the rest of our unit without many major highlights. Waterfowl was few and far between but we did find a pretty decent number of Greater White-fronted Geese. We met all of the other participants at the midday species count up at lunchtime. As a group, we had the highest species total by midday that we have ever had, 101! During the afternoon, my group birded throughout Greene-Sullivan State Forest but we were unable to add any species to the days total. The preliminary total for all the teams is 105, only 3 short of our all time record of 108.